"This is my favorite fudge recipe. It seems that the corn syrup keeps it from crystallizing or getting too hard." Lightly grease one 9x5x2 inch pan. In a 2-quart pot over very low heat, mix together the brown sugar, salt, soy milk, corn syrup, peanut butter and vanilla. Cook until hot and brown sugar is dissolved. Quickly pour into pan and refrigerate. Cut into squares and store in semi-airtight container in refrigerator. This smooth fudge combines the flavors of peanut and marshmallow. Delicious! I feel that the instructions are not clear to anyone inexperienced. 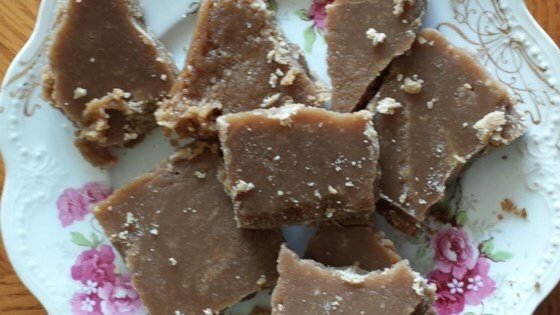 Most fudge recipes need to be beaten until they are no longer glossy to get that fudgey texture. I was happy when I saw the vegan label, having one in my household, but this recipe turned to mush and was unservable. I got the brown goo too. On the bright side....it would make a good ice cream topping. There is not enough peanut butter in this recipe to give it any flavor. Not worth 1 star! Flavorless! I agree with everyone who wrote a review. I should have read the reviews before making this fudge, could have saved money and time. I made my fudge 3 days ago and it still hasn't set up.